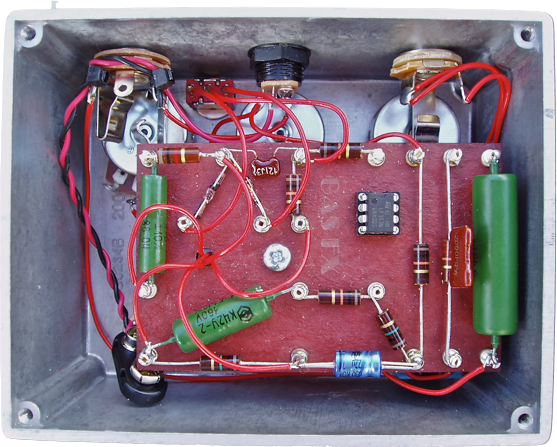 "If you have spent money on a great guitar, hand wound pickups, and a killer amp, why would you consider routing your signal though a bunch of cheap components, mass produced on a flimsy pcb?" I decided to build the GasFX kit to brush up up my soldering skills ahead of this year big project (and add a useful boost/overdrive pedal to my board). The kit from GasFX comes with all parts and instructions to build the pedal. Always worth checking that nothing has been missed and you understand where all the components go before you start.. Assuming you are competent with a soldering iron, then populating the board is a breeze. The diodes and IC socket are tricky for large fingers..
Decided to use the case supplied to prototype a 'vintage' look. The height of the case comes across as a little bulky, however you soon realise this is an advantage when assembling the components into such a relatively small space. I may decide to use an alternative box and hand paint a design some other time like a ZVEX 'box. Did the pedal work first time - NO...however a little fault finding identified a couple of schoolboy errors on my part and after correcting some dry joints we had lift off. Great sense of satisfaction. I love boost and transparent overdrive pedals and if you are in the market for one the GasFX DriveThru is highly recommended. The sweet spot for me is gain set to around 9 o'clock as can be heard in the demo below.. Noticed on the parts list a 220R x 1 Red Red Brown Gold resistor that does not appear on the board in the photo. Can you tell me where this goes and what it does?